Definitely check out I Heart Cool Stuff's blog for all that is cool and/or cute in the way of art, toys, plushies, events and more. We are happy to sponsor a contest being run by ToysREvil in celebration of the 5th anniversary of the TRE blog! We have provided Andy with an awesome Joe Ledbetter Terror & Magnus Death Metal colorway as a prize for the first of many giveaways he is organizing for the anniversary. You can enter the contest by clicking here, or if you just can't leave it to chance, you can purchase one here. Terror & Magnus is another killer figure from The Loyal Subjects. The other day Steph and I stopped by Alex Pardee's ZeroFriends pop-up shop, which is located in the old Upper Playground space next to Giant Robot NY on East 9th Street, between 1st Ave and Avenue A. 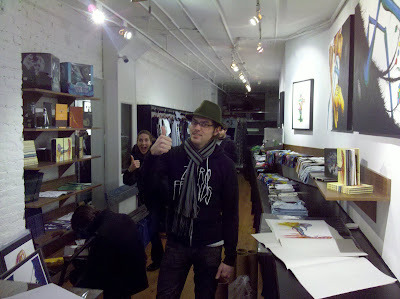 Sweet shop, great Pardee shirts & artwork to be coveted and collected. Two must-see shops right next to each other. Get there before the ZeroFriends pop-up shop closes! 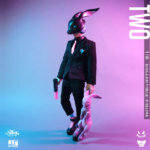 If you haven't yet seen Alex's Bunnywith #2 comic book, here's your chance. Hysterical! The extremely rare Mars-1 Observer SEEN Planet 6 edition figure is on sale now in our sale section for only $35! We also have an alternate colorway and the original colorway for sale. Kuso Toys' Celsius Transitions 7-inch figures are in stock now! Limited production to 100 pcs. Each figure comes with guns, wings, a backpack and a mini comic. This plush replica looks just like the doll Little Sister is seen carrying in the teaser images for Bioshock 2. Cobbled together from items she found in Rapture, the replica re-creates the look of Big Daddy's baseball head, wire frame cage, corkscrew arm and more. Plush body and rotocast plastic head. This doll stands almost 7" tall, made by NECA. Definitely a creepy and custom-looking production toy. Shipping to retailers now; will be here in a week or so. Retail price will be around $24. Shawnimals - Shop - NotM: Yeti Ninja! 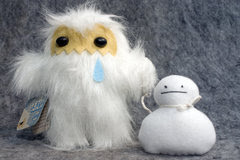 Shawnimals next limited edition plush release combines two of the designer toy industry's favorite motifs: yetis & ninjas! 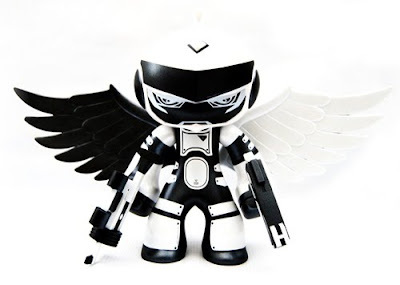 What could be better than the Yeti Ninja, to be released today for $30 apiece? The Yeti Ninja is a force to be reckoned with, and yet is terribly lonely. He wouldn’t admit that of course. He needs to keep his monster cred in mind after all. From the tag: This lonely, misunderstood beast of a Ninja lives in the snowiest, most remote parts of the Feroshi Mountains, without a soul nearby. Except for his BFF snowman pal named Rawr. That he made. With his own paws. It’s a little creepy, sure, but mostly sad. -A handmade 7" × 7" plush Ninja limited to 100 pcs. 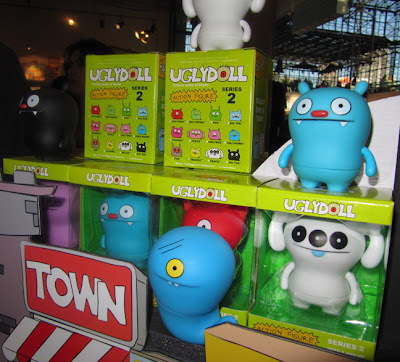 Preorder yours today in our Mimobot section! They should arrive next week. Definitely one of my favorite full-sized vinyl toys, the 7-inch tall Celsius Transitions figure is up for preorder now on our site for $80. 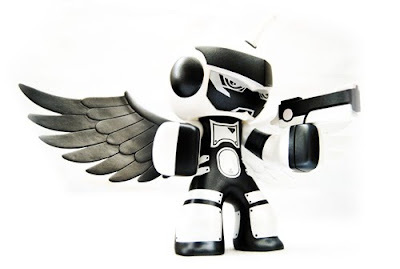 Comes with wings, 2 guns, a mini comic and a backpack! Will arrive in about a week. Bom Vimdin : Advoszec, originally uploaded by resonantfish. Collin David (aka resonantfish) shares with us his series of 56 original sketch cards for the Suckadelic x Topps x Star Wars Galaxy Series V cards. Click here to see all of them in one flickr gallery. 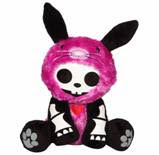 New Skelanimals in 3 cool cosplay styles: Jack the Rabbit, Kit the Cat and Marcy the Monkey. Retail price will be $15 each, more info coming soon. 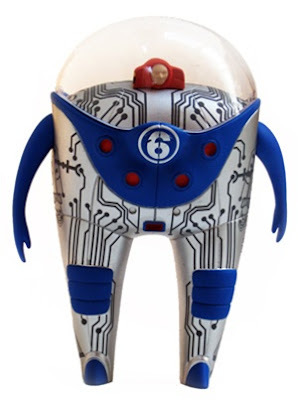 Toy2R offers this teaser for the 2010 assortment of newly designed 2.5” Qee characters based on the Skelanimals core characters to be released worldwide. To add a unique spin to the line – the collection will feature “inspired by” original designs by some of the best designer artists from across the globe. More than 20 artists are participating in the first unearthly endeavor to bring Skelanimals to life in the designer toy realm. 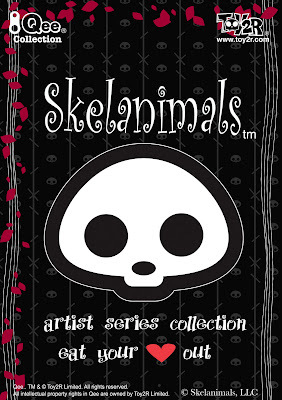 The collection will include a wide variety of artistic interpretations, all capturing the essence of the Skelanimals universe. Road kill with heart will now come with a Qee keychain attachment so you can carry your Skelanimals Qee wherever you go! Star Wars Sketch cards, originally uploaded by AbNoN. AbNoN sends word that he has finished customizing his contribution to the Topps Star Wars card series. AbNoN's a talented artist and customized a sweet Rollie for NEMO's Rollie Show last year. Watch for more art and toys out of him soon, and follow his blog to keep up todate! AbNoN works with Suckadelic, churning out bootleg SW action figures. Pictured below is the intricately and delicately detailed "Giddy Up!" 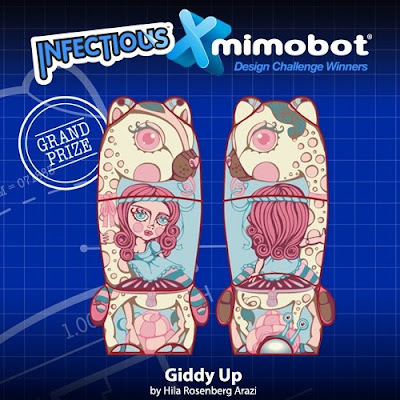 Mimobot design by Hila Rosenberg Arazi. This design features a girl riding a giraffe and was chosen by the Mimobot community as the winning design out of 666 entires. I just saw it in person and I have to say that the detailing in the paint on this design far surpasses anything Mimoco has produced in the past. Release date on this design is March 15th. 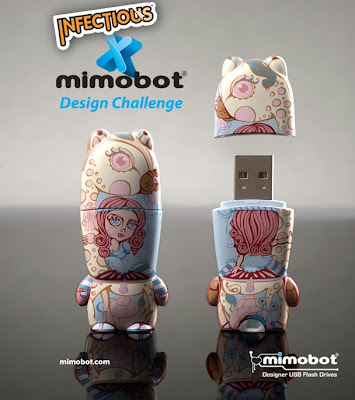 We've already placed our order for some 4GB and 8GB tokidoki Adios & Ciao Ciao Mimobots, the much-anticipated followups to last years extremely popular tokidoki x Mimoco designs. 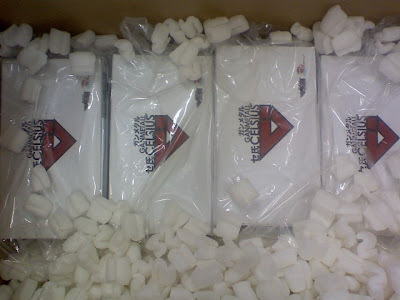 Adios & Ciao Ciao Mimos should arrive soon and you'll be able to find them in our Mimobot section. And finally, we were able to see all of Mimoco's 2010 Star Wars Mimobots in one place. The new designs will be released in April. Stay tuned for more info on those! One of the advantages of living in NYC is that we get to go to the NY Gift Fair, where we can get an early glimpse at some upcoming toys. 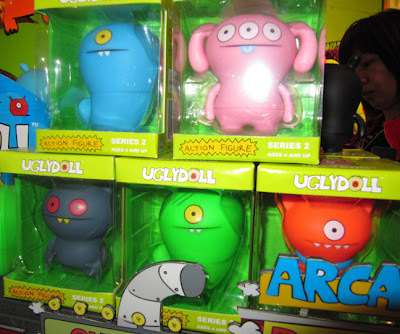 Our first stop at this Gift Fair was the Uglydoll booth where we were able to see the Uglydoll Action Figures series 2 for the first time in person! They'll be released in the spring (around March) and the will retail for $10 apiece. 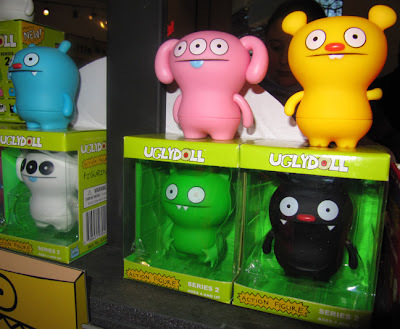 Series 2 is twice a big (6 different Uglies, each available in 2 different colorways) and this time, if I got this right, they will be available as both blind-boxed and window-boxed figures. 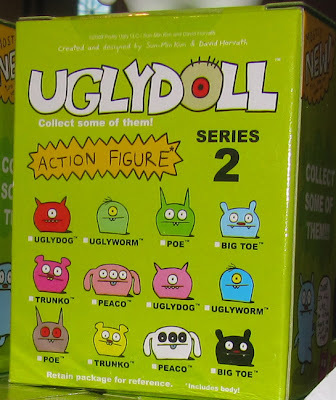 We put in an order for a full carton of the Series 2 action figures, but we're not allowed to put up preorders so we'll just keep you posted on the arrival dates. The GID IceBat series is blind-boxed but the cool thing is that is comes in cases of 6, and each full case contains one of each color so it's easy to collect the whole set- just buy a full sealed case! And at only $8 apiece, the GID Icebats are quite affordable.